Hi, I’m Vicki and I write a blog called ‘Normal for Glastonbury’ all about living in Glastonbury. Jill, your host at Middlewick, has kindly commissioned me to write some posts about the town on Middlewick’s blog. She invited me along to one of their popular and regular pizza nights, where locals and visitors are invited to meet and mingle while eating heaps of delicious pizza. To offset the calories I made the short and almost flat journey from town to Middlewick by bicycle, arriving just after 5.30 for the first part of the evening. 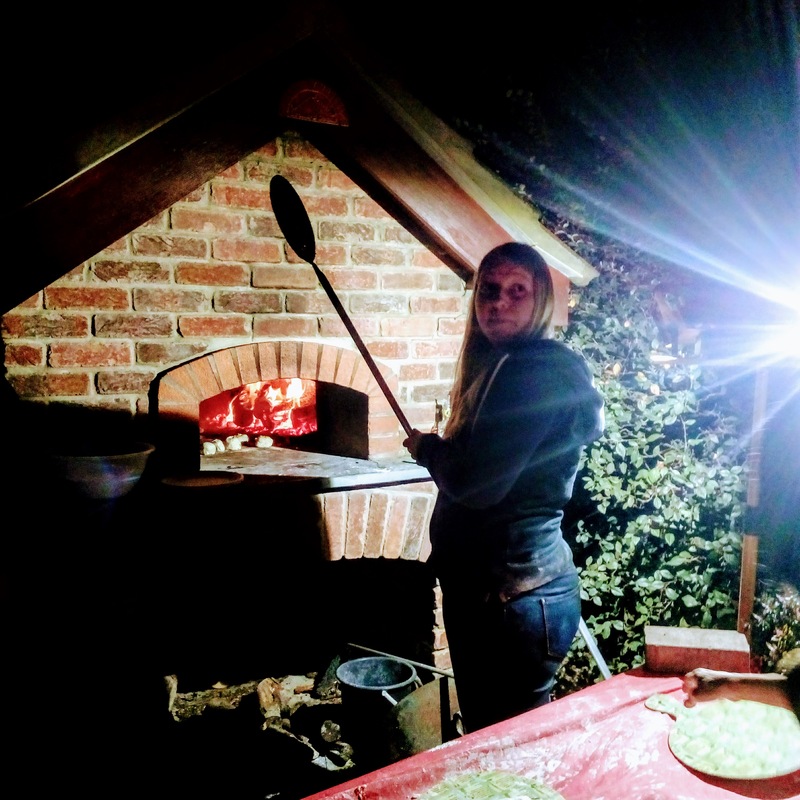 I arrived to find a number of families assembling their own pizzas from dough (prepared by friendly chef Keren) and numerous toppings, which they then took outside to the wood fired oven where they were expertly cooked by Jill’s friendly team. Waiting for my own creation to be ready at the pizza oven and sitting around the big tables in the function room gave me an excuse to talk to everyone and ask them what brought them to Middlewick, while they tried to answer with a mouthful of hot dough and stringy cheese. I met a Japanese lady with her husband who had been living in Brighton, but had enjoyed their many stays at Middlewick so much that they had moved to Glastonbury six months ago. She commented that she went out more in Glastonbury than Brighton because there was more going on in, which both surprised and pleased me. Her pizzas were delightfully symmetrical. 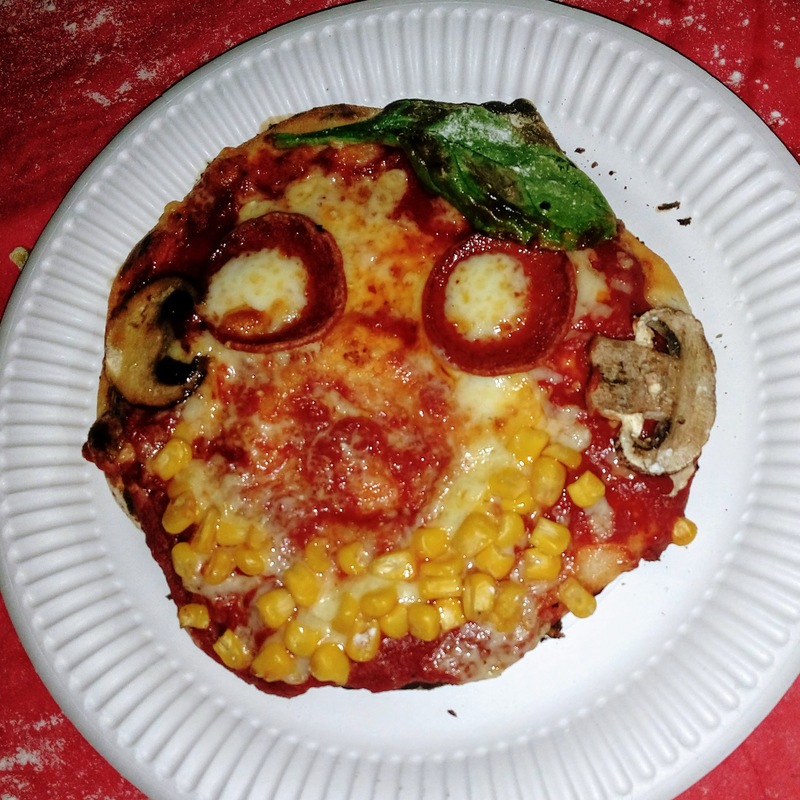 One of Jill’s visitors was Justin, a Chinese Canadian boy who goes to school in Taunton, and particularly impressed me by turning the ‘make a funny face pizza’ concept into an art form, complete with sweetcorn beard. Someone commented it looked like Jesus, but I thought it was more like Cheesus. If there had been a prize for best pizza it would have gone to Justin. 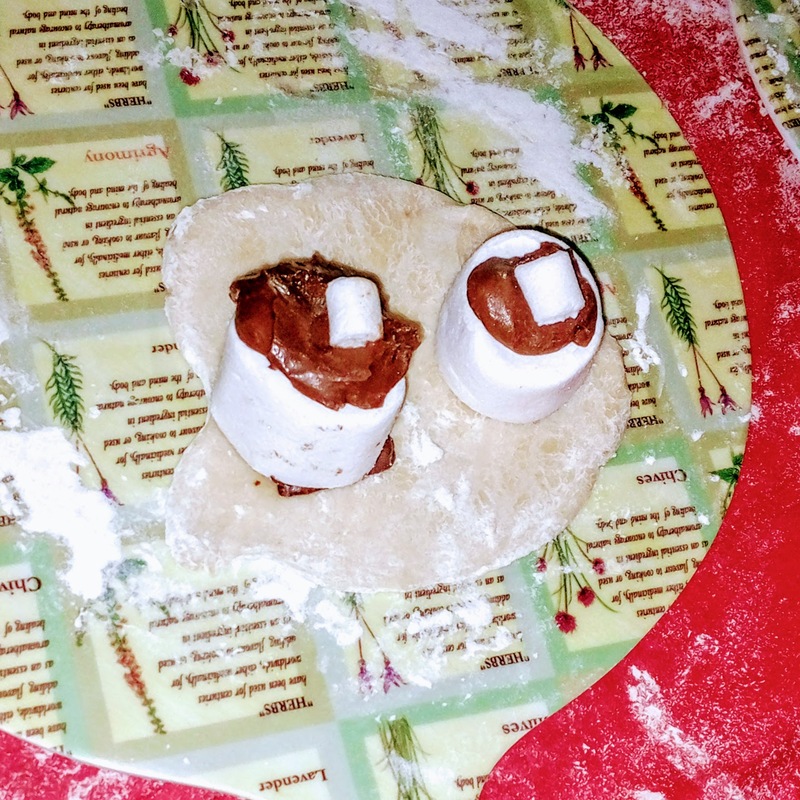 However, this nutella and marshmallow creation, constructed by a small child who couldn’t understand why we were all laughing, would have to be awarded the boobie prize…. A family from London were talking about their visit to Glastonbury Lake Village Museum above the Tourist Information Centre in the Tribunal. The TIC staff had seemed surprised that anyone should want to go upstairs to the museum and pointed out that they would have to turn the lights on especially for them. They then found a couple of the light bulbs had blown making the museum gloomy and some of the exhibits were hard to see. It seems a shame that when Glastonbury has such a fascinating history the museum is hidden away and under visited. The kids were clearly enjoying making their own pizzas. 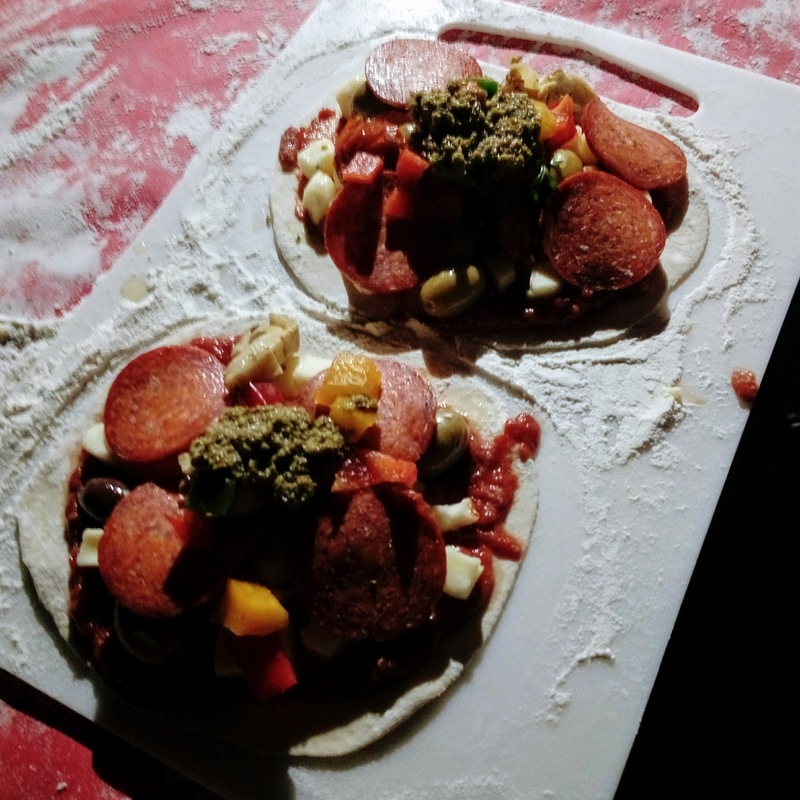 Some had perhaps not realised they were welcome to make as many pizzas as they liked, and appeared to be working on the ‘eat as much as you can pile on a plate’ principle, with multiple toppings stacked four inches high and in danger of melting into a huge puddle on the stone of the oven. 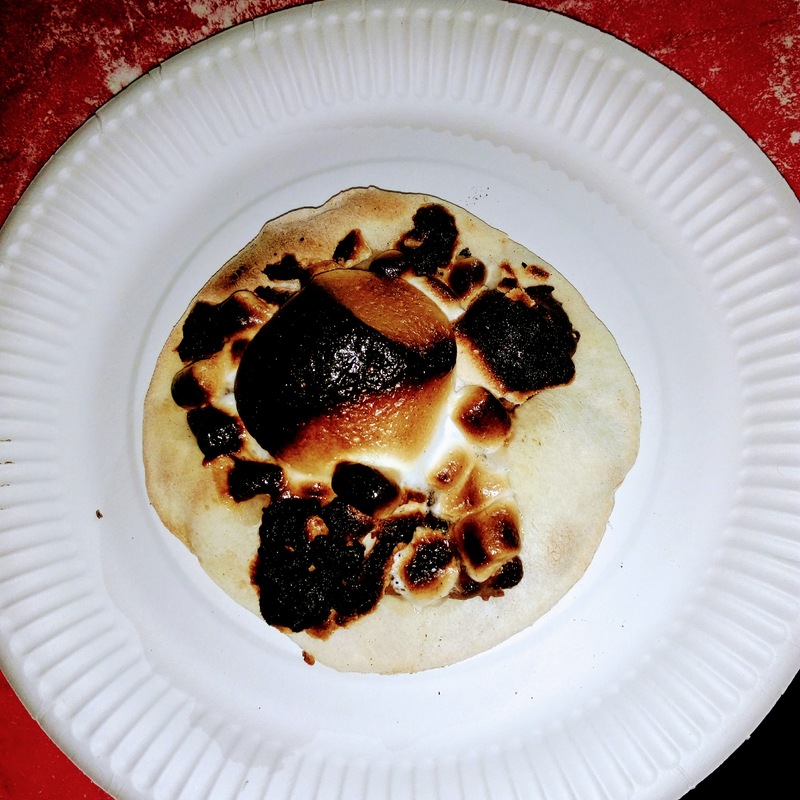 At a previous pizza night someone came up with a pepperoni and marshmallow combination, strangely this doesn’t appear to be a popular choice. Here is my nutella and marshmallow creation. I was fascinated to meet Soso, a Glastonbury artist originally from Norway, who makes beautiful, detailed fantasy characters, and fantasy and historical costumes. You can see some of her work here on her Alderworlds website. I also chatted with a visiting family from Newcastle, a reflexologist from Frome with her very entertaining son (who talked me through his choice of toppings with Jamie Oliver like enthusiasm) and a local organic fruit and veg seller. To read more of my writing about life in Glastonbury, England’s oddest town, please check out my blog at Normal for Glastonbury. Posted in dog friendly | Family Friendly | Farm shop | Glastonbury | Places to Eat | somerset | Somerset Cider | Tourist Things to Do and tagged Food | Glastonbury | Glastonbury Town | Make your own pizza | pizza in glastonbury | pizza in somerset | somerset.